The third club preview is of the Austin Aztex. They are the 2013 Mid-South Division and Southern Conference winners. The Austin Aztex are one of the newest PDL franchises and the minority owner of the previous Aztex team, David Markley, founded the club in 2011. (The old Aztex moved to Orlando to become Orlando City SC.) Paul Dalglish, the son of Liverpool legend Kenny Dalglish and a MLS cup winner with the Houston Dynamo, coaches the club. Markley’s vision was to develop a soccer club with local talent that plays attacking soccer, and the past two seasons that vision has come into fruition with Daglish at the helm. The large majority of the Aztex players have some sort of ties to Austin or Texas – either through their college team or hometown. The Aztex enjoyed a successful first season last year, finishing second in the Southern Conference playoffs (losing 4-2 to Orlando’s U23 team in the final) and scoring the most goals in the conference. After the PDL season, three Aztex players Dillon Powers (a candidate for MLS rookie of the year), Kekuta Manneh and Blake Smith were all drafted in the top eleven places of the 2013 MLS draft. There hasn’t been a sophomore slump for the Aztex as the club only improved in its second year in the PDL. Austin finished with the (11-1-2 , 35 pts) record in the regular season and ended the year in the top-5 in the PDL in goals scored and fewest goals allowed – a testament to the club’s balance. The franchise plays its games at House Park, unfortunately a football stadium that was built in the 1930s but fortunately located close to downtown Austin and an intimate venue (no track). The team played in front of its largest crowd 2,673 last match in a 2-0 win over Laredo Heat in the Southern Conference finals. The large crowd was due the Austin Aztex supporters - Eberly’s Army. The fan group (formerly known as Chantico’s Army) supporters all soccer in the Austin area. Austin received two awards after its inaugural season The team’s staff won the marketing award and was heralded for its busy twitter account, and Director of Operations, Ric Granryd earned the Betsy McAdams Key Grip Award. Just like the Victoria Highlanders, Austin’s strength is its backline and goalkeeper Devin Cook, who has 10 shutouts this season. The defense was the best in the Southern Conference giving up .57 goals per game in the regular season and the Aztex shutout both opponents in the Southern Conference playoffs. Zack Pope, Austin’s captain, is the team’s leader and coach on the field that loves to attack from his left back position. His wingback partner, Max Gunderson is another high flying attacking wingback that loves to get up field and spray crosses into the box; but don’t think the two are just offensive fullbacks – they both can and will defend when they are called upon. 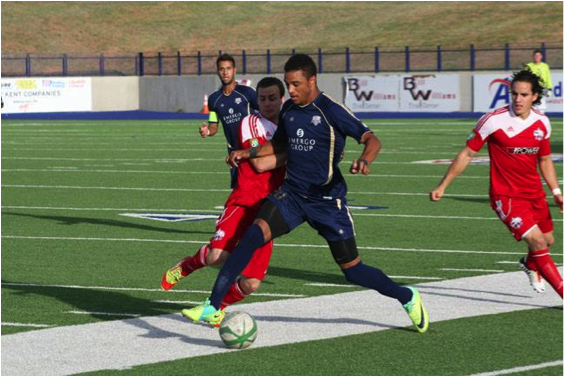 Aaron Guillen, 20, is the quarterback of the Aztex backline who helps set up the attack from his center back position. The El Paso native is probably the best 1v1 defender on the squad, and for such a young defender he is tactically astute and is never caught out of position or ball watching. Standing at 6’5” Walker Hume is the muscle of the bunch. He eloquently does his job of clearing any set pieces or corners or dealing with the opposition’s center forward. For such a tall player, Hume is also very confident with the ball at his feet. The intangible strength is Austin’s never quite attitude and togetherness as teammates. I know this sounds like coach speak, but the Aztex prove it on the field as the club is 3-1-1 in games when the opposition scores first. Oh, don’t let Austin find the back of the net first because the club is 10-0 when it scores first. Four Austin players, Cook, Kris Tyrpak, Gunderson and Tony Rocha, were named to the USL PDL’s at Southern Conference players, but the I think the two Austin players to watch are Andres Cuero and Rocha. The two play in the Aztex midfielder and both are threats as scorers and creators. I constantly compare Rocha to the Aztex version of Andrea Pirlo. The Tusla midfielder is so smart with the ball and his passes always find a teammates feet. Rocha shows up in the biggest games too, and he scored or helped set up goals in all three of Austin’s 2-1 comeback wins during the season. He is a magician with his left-foot and will likely player MLS in a year or two. 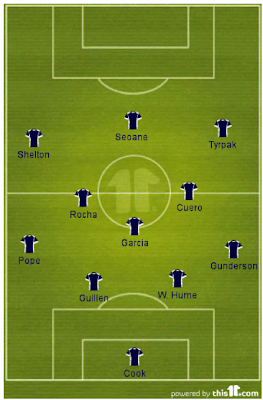 Stop Rocha and you can defeat the Aztex – the problem is no one has been able to even slow him down. When looking back on this season, one change has defined the Austin Aztex and that’s Paul Dalglish decision to move Cuero from a striker to an attacking midfielder. Since the move, Cuero has thrived, receiving more of the ball and confidently attacking and running at opponents when he receives it. Austin has also improved as well. In the first seven games (when he played forward), Austin averaged 1.7 goals per game, but since moving to play as a midfielder, the Aztex are averaging 3.18 goals a game. He always times is runs from the midfield perfectly like Michal Bradley for the USMNT. Khiry Shelton only played the last two regular season games for the Aztex, but the late season acquisition could be the deciding factor in the PDL finals. 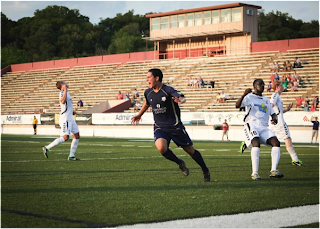 The 6”3’ striker is lighting quick, and he has scored four goals and has two assists in four games with the Aztex. His pace stretches out the defenses and allows Austin to play long balls over the type (along with their usually tiki-taka style of attack) and it creates more space for Sito Seoane and Kris Tyrpak to attack the opposition. But Shelton isn’t just speedster, he can score some spectacular goals as he has proven in the past. The second x-factor will be the Austin crowd. Eberly’s Army will be as rowdy as ever but will there be 3,000 or more fans behind them cheering for Austin. If the crowd is as crazy as it usually is, it should be a huge advantage for the Aztex. Least I forget, Austin is 9-0 at home and has scored 29 goals while only giving up three. House Park is a fortress for Austin.